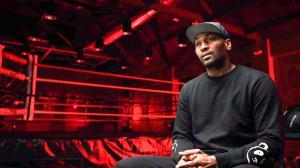 Ron Artest, who changed his name to Metta World Peace in 2011, shares his life story in a compelling documentary film. 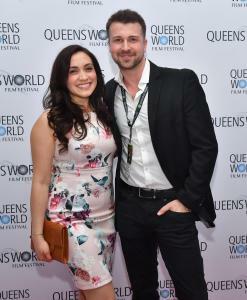 Actress Erica Camarano and filmmaker Nick Ronan created the narrative film The Secret Nobody Knows, which is screening during the Queens Corner block of short narratives on Sunday, March 31 at 6:45 p.m. at Museum of the Moving Image’s Redstone Theater. 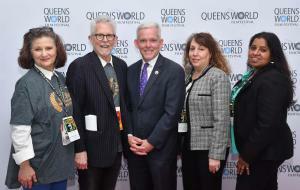 New York City Council Member Jimmy Van Bramer (center) attended the Queens World Film Festival’s (QWFF) opening night event. In the photo left to right are - QWFF’s Katha and Don Cato and Mr. Van Bramer along with Investors Bank’s Maria Odysseos and Valini Khameraj. ASTORIA , NEW YORK , UNITED STATES OF AMERICA, March 28, 2019 /EINPresswire.com/ -- A professional athlete who made a difference both on and off the basketball court is the subject of Quiet Storm: The Ron Artest Story. The East Coast premiere of this 2018 documentary film will be screened during the Ninth Queens World Film Festival (QWFF). It’s All About The Dance, Friday, March 29, at 6 p.m., in the Zukor Screening Room, Kaufman Astoria Studios, 34-12 36th St., Astoria. Presented in partnership with Queensboro Dance Festival, this block offers six short narratives and one documentary. Queens Corner, Sunday, March 31, at 6:45 p.m., at MoMI’s Redstone Theater. A celebration of Queens filmmakers, presented in partnership with Table Wines, It’s In Queens, I Love NY, BMJ Studios and Astoria Films, wraps up the festival. Here’s the lineup of films and directors: The Secret Nobody Knows, Nick Ronan; Some of Her Parts, Abie Sidell; Eodiya, Jules Suo; Beyond the Veil, Sandy Ismail; Into the Dark, Benjamin Berger; and Best Wishes, Kevin Etherson. For the sixth year in a row, Investors Bank has served as the lead sponsor of the QWFF. The bank also presented the festival’s Opening Night Celebration at MoMI. QWFF’s Young Filmmakers Program is sponsored by Investors Bank and the project gives a fifth-grade class at PS69Q in Jackson Heights an opportunity to experience film production. Turning nine in 2019, QWFF includes an annual multi-day/multi-venue festival, youth-oriented educational initiatives and year-round screening opportunities for QWFF filmmakers, past and present. The festival is programmed in thematic blocks with evocative titles, and each program is followed by a post-screening dialogue to engage audiences from the demographically diverse communities that comprise the borough of Queens. Each year the festival has a very robust submission session, with films coming from all over the globe.